-It is a leather item which is use to keep your precious things. 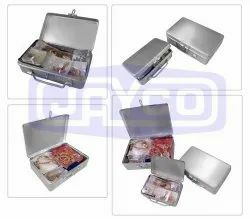 We are one of the best provider of Alligator Stock Folder in the Industry. Our company has gained name and fame in presenting Leather Jewellery Case. Justifying our reputation in this highly competitive industry, we have brought a wide assortment of Jewellery Box. We are one of the prominent firms involved in offering premium quality Leather Jewellery Case.